묘법연화경은 줄여서 ‘법화경’이라고 부르기도 하는데, 우리나라 천태종의 근본경전으로 부처가 되는 길이 누구에게나 열려 있음을 기본사상으로 하고 있다. 화엄경과 함께 우리나라 불교사상의 확립에 가장 크게 영향을 끼쳤으며, 삼국시대 이래 가장 많이 유통된 불교경전이다. 이 책은 후진의 구마라습(鳩摩羅什)이 번역한 『묘법연화경』 7권을 고려 공민왕 22년(1373)에 은색 글씨로 정성들여 옮겨 쓴 것이다. 각 권은 병풍처럼 펼쳐서 볼 수 있는 형태로 되어 있으며, 크기는 세로 31.4㎝, 가로 11.7㎝이다. 책 끝의 기록에 의하면 당시 봉상대부 허칠청의 시주로 간행하였음을 알 수 있다. 뒷면에 ‘영암도갑사유전(靈巖道岬寺留傳)’또는‘당사유전(當司留傳)’이라고 먹으로 쓴 기록이 몇 군데에 보이고 있어 원래 전라남도 영암의 도갑사 소장본이었음을 알 수 있다. 불경의 내용을 요약하여 그린 변상도(變相圖)는 없으나, 정성들여 만들었고 보존이 잘 된 편이다. 특히 이 책은 일본으로 유출되었다가 최근에 되찾아온 것으로서 더욱 중요하게 평가된다. Saddharmapundarīka Sutra, or the ‘Lotus Sutra’ is the principal scripture of the Korean T'ien-t'ai Sect. The main idea of the book is that the way to become a Buddha is being to open to everyone. Along with the Avatamsaka Sutra, this principal scripture of the Avatamsaka Sutra is one of the books that had the greatest effect in the establishment of Korean Buddhist philosophy and most widely read since the of Three Kingdoms Period. 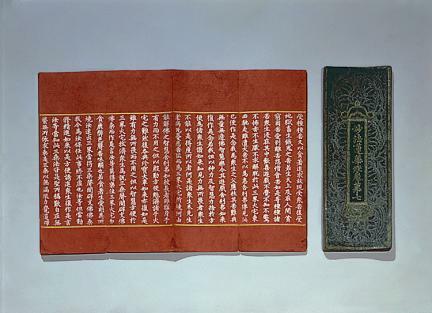 This book was copied with extreme effort in the 22nd year of King Gongmin of the Goryeo Period from the seven books of the Saddharmapundarīka Sutra translated by Kumārajiva of the Later Qin Dynasty. 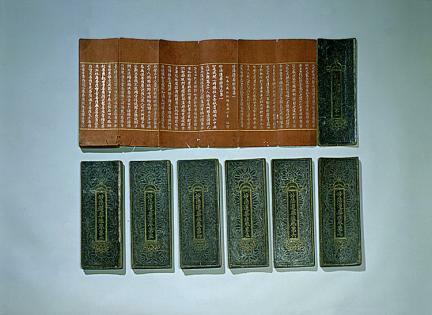 The characters are written in silver and each book is made in the form of a folding screen, 11.7cm long and 31.4cm wide. According to the remark at the end, this book was published as an offering by a senior government official by the name of Heo Chil-cheong. The writings found in several places on the back cover suggest that this had been originally kept at Dogapsa Temple in Yeongam. Although it does not contain a summary painting, the book is made with utmost care and preserved in a relatively good condition. It was once taken to Japan, but recently returned to Korea.